Objectives This study investigated the effects of dose step-down in patients with rheumatoid arthritis (RA) who achieved sustained disease control with baricitinib 4 mg once a day. Methods Patients who completed a baricitinib phase 3 study could enter a long-term extension (LTE). In the LTE, patients who received baricitinib 4 mg for ≥15 months and maintained CDAI low disease activity (LDA) or remission (REM) were blindly randomised to continue 4 mg or taper to 2 mg. Patients could rescue (to 4 mg) if needed. Efficacy and safety were assessed through 48 weeks. Results Patients in both groups maintained LDA (80% 4 mg; 67% 2 mg) or REM (40% 4 mg; 33% 2 mg) over 48 weeks. However, dose reduction resulted in small, statistically significant increases in disease activity at 12, 24 and 48 weeks. Dose reduction also produced earlier and more frequent relapse (loss of step-down criteria) over 48 weeks compared with 4 mg maintenance (23% 4 mg vs 37% 2 mg, p=0.001). Rescue rates were 10% for baricitinib 4 mg and 18% for baricitinib 2 mg. Dose reduction was associated with a numerically lower rate of non-serious infections (30.6 for baricitinib 4 mg vs 24.9 for 2 mg). Rates of serious adverse events and adverse events leading to discontinuation were similar across groups. Conclusions In a large randomised, blinded phase 3 study, maintenance of RA control following induction of sustained LDA/REM with baricitinib 4 mg was greater with continued 4 mg than after taper to 2 mg. Nonetheless, most patients tapered to 2 mg could maintain LDA/REM or recapture with return to 4 mg if needed. Professional guidelines in rheumatoid arthritis (RA) suggest that in patients who achieve sustained remission with disease modifying antirheumatic drug (DMARD) therapy, consideration should be given to attempting DMARD taper. Clinical studies evaluating this treatment strategy for targeted synthetic DMARDs (tsDMARDs) are lacking. This randomized, blinded substudy within an ongoing Phase 3 extension trial evaluated dose taper of baricitinib, an inhibitor of Janus Kinase (JAK) 1 and 2, from 4 mg to 2 mg oncedaily in patients who had achieved sustained disease control (low disease activity or remission) with the 4 mg daily dose. The results indicated that while 4-mg was the more efficacious dose, many patients could maintain control of disease activity following dose taper to 2-mg, and for those who did not, disease control could be recaptured with return to 4-mg if needed. How might this impact on clinical practice or futured evelopments? This study provides robust data to inform the use of baricitinib according to professional treatment guidelines regarding consideration of DMARD taper following inductionof sustained disease control in RA. Treatment goals in rheumatoid arthritis (RA) include achieving remission (or at least low disease activity (LDA) in patients with long-standing disease), preventing accrual of joint damage, maximising physical function and improving quality of life.1 Once this state is achieved and maintained, both the American College of Rheumatology and the European League Against Rheumatism recommend reducing the dose of biologic (b), targeted synthetic (ts) and conventional synthetic (cs) disease-modifying antirheumatic drugs (DMARD) in their guidance documents.2 3 While overall burden of drug intake and societal or individual costs is thereby reduced, the important aspect in the course of tapering RA therapy is maintenance of sustained disease control. Dose reduction or even cessation of bDMARD therapies has been the focus of several trials in the current decade.4–8 While many patients can sustain their improved clinical state with cessation or reduction in dose, flare-ups occur in a significant number of patients. Reintroduction of therapy is associated with recapture of the state prior to dose reduction in most but not all patients. However, almost half of csDMARD-treated patients who flare following cessation of therapy do not regain their previous state of remission.9 The consequence of cessation or reduction in dose of tsDMARDs following attainment of LDA or remission is unknown. Baricitinib, a selective Janus kinase 1 and 2 inhibitor, modulates signal transduction of a variety of cytokines involved in the immune-inflammatory response.10 Baricitinib is approved for the treatment of moderately to severely active RA in adults in over 40 countries including European countries, USA and Japan. Approval was based on the results of four pivotal phase 3 studies (RA-BEGIN, RA-BEAM, RA-BUILD and RA-BEACON) and a single long-term extension (LTE) study (RA-BEYOND).11–14 Within RA-BEYOND, a randomised, double-blind substudy evaluated the effects of baricitinib dose reduction from 4 mg to 2 mg in patients who had achieved sustained disease control on the 4 mg dose. Herein we report results of this substudy. The baricitinib phase 3 programme included four pivotal studies. At entry into the programme, patients were ≥18 years old with moderately to severely active RA and had an inadequate response to methotrexate (NCT01710358, RA-BEAM), had an inadequate response or intolerance to ≥1 csDMARD (NCT01721057, RA-BUILD) or ≥1 bDMARD (NCT01721044, RA-BEACON), or had received no or minimal csDMARDs (NCT01711359, RA-BEGIN).11–14 Patients who completed any of the pivotal studies were eligible to enter RA-BEYOND (NCT01885078), which is an ongoing study designed to evaluate long-term safety and efficacy of baricitinib in patients with RA. Patients were not eligible for participation in RA-BEYOND if they demonstrated laboratory abnormalities or significant uncontrolled medical conditions that, in the opinion of the investigator, posed a risk to the administration of baricitinib. Patients receiving 4 mg or 2 mg baricitinib at the conclusion of an originating study remained on the same dose in RA-BEYOND. Patients receiving placebo or an active comparator at the end of the originating study were switched to baricitinib 4 mg upon entry. Patients and investigators remained blind to the original treatment assignment. Patients could continue to receive background non-investigational open-label csDMARDs, non-steroidal anti-inflammatory drugs or corticosteroids they were receiving at completion of the originating study. For patients originating from RA-BEAM, RA-BUILD or RA-BEACON, rescue therapy (open-label baricitinib 4 mg and/or addition or increase in dose of csDMARD) was allowed for any patient who had a clinical disease activity index (CDAI) score >10 at or after 3 months following enrolment in RA-BEYOND. For patients originating from RA-BEGIN, rescue therapy (addition of csDMARD) was provided at any time according to the discretion of the investigator. Patients in RA-BEYOND were eligible to participate in the step-down substudy if they had been receiving baricitinib 4 mg for ≥15 months (including time in the originating study) and achieved sustained LDA (defined by CDAI score ≤10 for patients from RA-BEAM, RA-BUILD, RA-BEACON) or remission (CDAI ≤2.8 for patients from RA-BEGIN) at two consecutive visits ≥3 months apart. This instrument was used for inclusion (and rescue where applicable) as it does not require a laboratory result, and therefore permitting immediate determination of eligibility at study visits. Prior rescue in an originating study or RA-BEYOND excluded patients from step-down eligibility. Patients meeting eligibility for participation in the substudy were randomised 1:1 (stratified by geographic region and originating study) to continue on baricitinib 4 mg or to step-down to 2 mg. Randomisation occurred via an interactive web-based system without knowledge of the investigator or patient. Patients receiving baricitinib 2 mg also received 4 mg placebo-to-match. Patients receiving baricitinib 4 mg also received 2 mg placebo-to-match, including those patients entering RA-BEYOND from RA-BEGIN and RA-BEAM in which only the 4 mg dose was investigated. Within the step-down substudy, investigators could provide rescue (to open-label baricitinib 4 mg±escalation of background csDMARD) at any time for patients who failed to retain LDA or remission or at any time for DMARD-naïve patients from RA-BEGIN. The study was designed by the sponsor, Eli Lilly and Company, an academic advisory board including non-Lilly authors of this manuscript, and Incyte. It was conducted in accordance with the ethical principles of the Declaration of Helsinki and Good Clinical Practice guidelines. All patients provided written informed consent before the first study procedure in RA-BEYOND. Consent for participation in the step-down substudy was obtained at the time of entry into RA-BEYOND. Lilly or its representatives provided data, laboratory and site monitoring services. All authors participated in data analysis and interpretation, reviewed drafts and final manuscript and provided critical comment. The authors vouch for the veracity and completeness of the data and data analyses. As RA-BEYOND is 10 years in duration, the study was designed to allow multiple data cuts and analyses (online supplementary figure S1). The sponsor was first unblinded to patient allocation during August 2015 to prepare for submission of the license application to regulatory agencies. The step-down substudy is an ongoing process where new patients continuously enter the study once the criteria are met. Additional data cuts have occurred periodically for regulatory reporting purposes. Importantly, investigators and patients continue to remain blinded to dose in the step-down substudy. The data cut-off date used to prepare this manuscript was 1 September 2016, when a substantial number of patients had entered the substudy at least 48 weeks before the cut-off, and thus had the opportunity to provide approximately 1 year of data after randomisation. Unless otherwise specified, the analyses presented focus on this September 2016 48-week analysis set. The prospectively defined primary endpoints for the substudy were (1) the proportion of patients who maintained a CDAI score of ≤10 in the DMARD-inadequate responder (IR) population (from RA-BEAM, RA-BUILD and RA-BEACON) after 3 months of treatment with baricitinib 2 mg daily compared with patients continuing treatment with 4 mg daily; and (2) time to relapse (defined as a CDAI score >10) after randomisation to baricitinib 2 mg or continuation on 4 mg in this population. These endpoints were included as secondary objectives in the RA-BEYOND protocol. Outcomes in the DMARD-naïve population from RA-BEGIN were assessed separately (due to the distinct inclusion requirement for CDAI remission in this group) and defined prospectively as exploratory endpoints. These outcomes included (1) the proportion of patients who maintained a CDAI score of ≤2.8 after 3 months of treatment with baricitinib 2 mg daily compared with patients continuing on 4 mg, and (2) time to relapse (defined as CDAI score >2.8) after randomisation to baricitinib 2 mg or continuation of 4 mg.
Additional analyses included assessments of change from the time of step-down randomisation in composite scores and their components, and analyses using differing definitions of relapse (ie, loss of CDAI categorisation at the time of randomisation, need for rescue). Evaluations in distinct patient populations of interest were also conducted, including patients in CDAI remission at step-down randomisation, csDMARD-IR patients from RA-BEAM and RA-BUILD, bDMARD-IR patients from RA-BEACON, larger pools of randomised patients who had shorter minimum periods (≥12 weeks, ≥24 weeks) before the present data cut-off and patient data from the initial sponsor unblinding at the August 2015 cut-off. The occurrence and severity of all adverse events (AE) were recorded and included step-down-emergent AEs (events occurring after randomisation into the substudy), serious AEs (including infections) and AEs leading to discontinuation. An independent data safety monitoring committee oversaw the conduct of all phase 3 studies evaluating baricitinib in patients with RA, including this LTE study. The modified intention-to-treat (mITT) population for the substudy included all patients who were randomised into the step-down substudy ≥48 weeks prior to the data cut-off date and had received ≥1 dose of study drug after randomisation. There was no prospective assessment of sample size and statistical power for efficacy analysis in the substudy. However, for a sample size of approximately 245 patients in each treatment group, there will be about 70%–90% of power to detect a true difference of 10% between groups using a two-sided Fisher’s exact test based on a significance level of 0.05. Treatment comparisons of CDAI response rate were performed using the Fisher’s exact test. The Kaplan-Meier method was used to assess difference in time to relapse between treatment groups. Treatment comparisons of continuous efficacy endpoints were performed using a t-test. As this was a substudy included in an LTE protocol, no multiplicity control was applied for endpoints assessed. All statistical tests were performed at a two-sided significance level of 0.05. Summary statistics were provided for safety data. Non-responder imputation (NRI), which considers rescued or discontinued patients as non-responders, was used for CDAI response analyses (NRI analysis). To determine overall long-term efficacy irrespective of rescue, analyses were also performed including observed data collected after rescue (NRI was still applied for discontinuation). In addition, the effect of reintroduction of baricitinib 4 mg was evaluated in rescued patients. At the time of the 1 September 2016 data cut-off used for these analyses, 2656 patients had been enrolled in the LTE study at 398 sites, with discontinuation <17% (online supplementary figure S2). A total of 975 patients were randomised in the step-down substudy at any time before this cut-off date (online supplementary figures S3 and S4). Of these patients, 559 were randomised ≥48 weeks prior to the cut-off and included in the 48-week analysis population (online supplementary figure S5); most patients completed 48 weeks, with discontinuation rates of 6% for baricitinib 2 mg and 5% for baricitinib 4 mg. At baseline (ie, prior to step-down randomisation), demographics and clinical characteristics, such as C-reactive protein (CRP), erythrocyte sedimentation rate (ESR), CDAI and simplified disease activity index (SDAI), were well balanced between the randomised groups (table 1). Among DMARD-IR patients who achieved sustained disease control with baricitinib 4 mg, dose reduction to 2 mg resulted in statistically significant reduction in LDA rates (CDAI ≤10) at 12, 24 and 48 weeks after randomisation, though the majority of patients retained a state of LDA or remission in both groups (figure 1A). Among patients who were in remission (CDAI ≤2.8) at step-down baseline, the majority were able to maintain remission in both dose groups through 48 weeks (68% baricitinib 4 mg, 56% baricitinib 2 mg; online supplementary figure S6). However, a statistically significantly smaller proportion of patients maintained remission after 24 weeks with dose reduction to baricitinib 2 mg (61%) compared with continued baricitinib 4 mg (76%). Based on exploratory tailoring analyses, there did not appear to be any baseline characteristics or baseline disease activity measures (disease duration, corticosteroid use, CDAI state and Health Assessment Questionnaire-Disability Index (HAQ-DI)) that could be used to define which patients would be better served by continuing baricitinib 4 mg instead of stepping down to baricitinib 2 mg (data not shown). Step-down efficacy through week 48: categorical CDAI state DMARD-IR (RA-BEAM, RA-BUILD, RA-BEACON) analysis set. Patients completed 48 weeks in the step-down substudy, or would have completed 48 weeks if not discontinued. All patients had CDAI≤10 at step-down baseline; a subset could have had CDAI≤2.8. n=245 for each group at each time point. For panel (A), NRI was applied for rescue or discontinuation. For panel (B), observed data were used after rescue; NRI was applied for discontinuation. *P≤0.05; **P≤0.01; ***P≤0.001 versus the continued on baricitinib 4 mg group. CDAI, clinical disease activity index; DMARD-IR, disease-modifying antirheumatic drug-inadequate responder; NRI, non-responder imputation. Dose reduction to 2 mg resulted in modest but statistically significant increases in CDAI, SDAI, Disease Activity Score for 28-joint counts based on the CRP (DAS28-CRP) and DAS28 based on the ESR (DAS28-ESR) compared with maintaining the 4 mg dose (figure 2). Compared with patients who continued on baricitinib 4 mg, statistically significant increases in swollen joint count, tender joint count, Physician’s Global Assessment of Disease Activity (figure 3A–C) and high-sensitivity CRP (online supplementary figure S7) were also observed after step-down to baricitinib 2 mg. Statistically significant differences between dose groups were not observed for other composite score components (pain, HAQ-DI, ESR; online supplementary figure S7). The step-down efficacy data at week 48 are included in online supplementary table S3. Step-down efficacy through week 48: continuous CDAI (A), SDAI (B), DAS28-CRP (C) and DAS28-ESR (D), DMARD-IR (RA-BEAM, RA-BUILD, RA-BEACON) analysis set. Values are observed means. P value based on difference in change from baseline between groups. Patients completed 48 weeks in the step-down substudy, or would have completed 48 weeks if not discontinued. *P≤0.05; **P≤0.01; ***P≤0.001 versus the continued on baricitinib 4 mg group. CDAI, clinical disease activity index; DAS28-CRP, Disease Activity Score for 28-joint counts based on the C-reactive protein; DAS28-ESR, DAS28 based on the erythrocyte sedimentation rate; DMARD-IR, disease-modifying antirheumatic drug-inadequate responder; SDAI, simplified disease activity index. 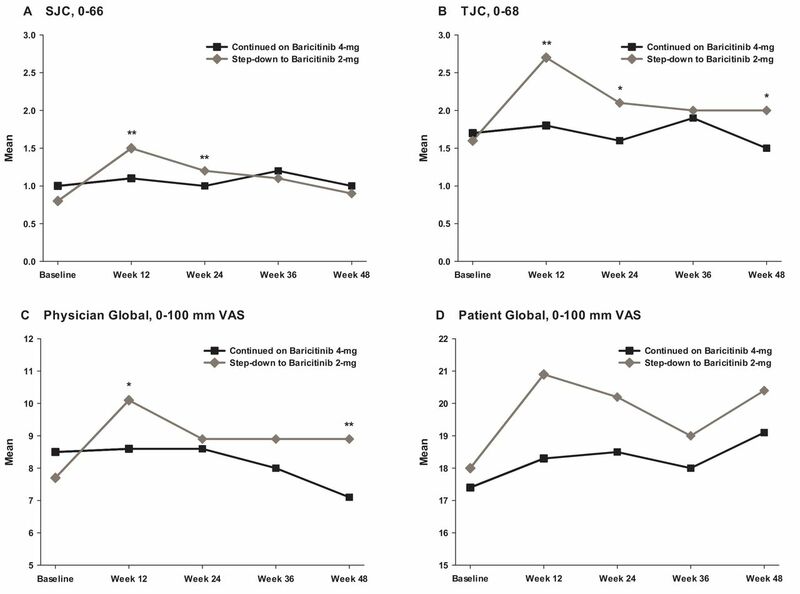 Step-down efficacy through week 48: continuous composite disease activity components SJC (A), TJC (B), Physician Global VAS (C), Patient Global VAS (D) DMARD-IR (RA-BEAM, RA-BUILD, RA-BEACON) analysis set. Values are observed means. P value based on difference in change from baseline between groups. Patients completed 48 weeks in the step-down substudy, or would have completed 48 weeks if not discontinued. *P≤0.05; **P≤0.01; ***P≤0.001 versus the continued on baricitinib 4 mg group. DMARD-IR, disease-modifying antirheumatic drug-inadequate responder; SJC, swollen joint count; TJC, tender joint count; VAS, visual analogue scale. Similar results were observed for the larger pools of patients randomised ≥12 and ≥24 weeks before the present data cut-off (online supplementary tables S1 and S2, respectively), and for analyses conducted at the initial August 2015 cut-off when the sponsor was first unblinded (online supplementary table S4). CDAI ≤10 and ≤2.8 response rates were similarly reduced after dose reduction for csDMARD-IR patients (online supplementary figure S8A). Findings with respect to continuous measures for composite scores and their components were also consistent with those from the overall DMARD-IR patient group (online supplementary table S5). A consistent pattern was seen for bDMARD-IR patients, though differences between the two dose groups were not statistically significant (online supplementary figure S9A and table S6), possibly due to the limited number of patients. 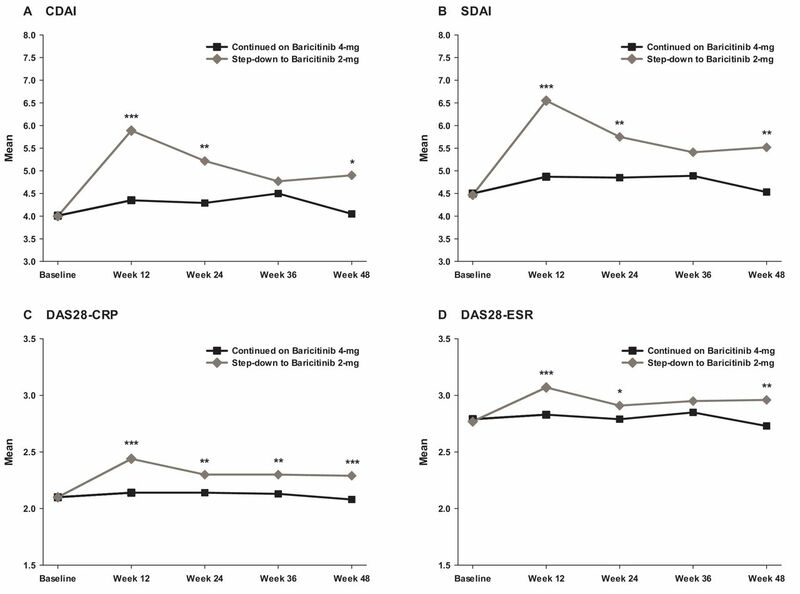 In the small group of DMARD-naïve patients, where sustained CDAI remission was required for step-down study participation, minimal differences were observed between the continued baricitinib 4 mg and baricitinib 2 mg groups over 48 weeks in the step-down study (online supplementary figure S10A and table S7); in both dose groups, most patients were able to maintain remission status, and most patients who lost remission status were able to retain LDA (online supplementary figure S10A). When considering the individual patient’s CDAI state at the time of randomisation (either LDA or remission), although most patients maintained this in both groups over time, dose reduction resulted in a statistically significantly higher proportion of patients who lost their state of disease control compared with those who remained on the 4 mg dose (29% for baricitinib 4 mg vs 43% for baricitinib 2 mg at week 48, p≤0.01; online supplementary table S8). Rescue rates through week 48 in the overall 48-week mITT analysis set were 10% for those who continued on baricitinib 4 mg and 18% for those who stepped down to baricitinib 2 mg (online supplementary figure S5). Most rescued patients could regain LDA or remission after rescue to baricitinib 4 mg (66.7% for baricitinib 2 mg→4 mg 24 weeks after rescue in the DMARD-IR group; online supplementary table S9). Among the 16 patients who did not recapture their baseline (randomisation) CDAI status 24 weeks after returning from 2 mg to the 4 mg rescue dose, the majority (13/16) were able to do so at a subsequent time point. Additional analyses were performed to determine overall efficacy irrespective of rescue. Results showed more patients achieved LDA or remission when postrescue data were used in the analyses than when postrescue data were censored and imputed as non-response (figure 1B); online supplementary figure S8B, S9B and S10B). The durability of treatment effect was evaluated by examining the kinetics of relapse. Compared with patients who continued on baricitinib 4 mg, dose reduction to 2 mg resulted in significantly more patients having a quicker relapse. This observation was consistent across various definitions of relapse, including loss of step-down eligibility criteria (figure 4A), rescue (figure 4B), loss of step-down eligibility criteria at two consecutive scheduled visits (online supplementary figure S11A) or loss of step-down baseline CDAI status (online supplementary figure S11B). Step-down efficacy through week 48: time to relapse RA-BEAM, RA-BUILD, RA-BEACON analysis set. Patients completed 48 weeks in the step-down substudy, or would have completed 48 weeks if not discontinued. P value is from the Wilcoxon test. For panel (A), relapse was defined as loss of step-down eligibility criteria, or CDAI>10 for DMARD-IR patients originating from RA-BUILD, RA-BEAM or RA-BEACON. For panel (B), relapse was defined as rescue. *P≤0.05; **P≤0.01; ***P≤0.001 versus the continued on baricitinib 4 mg group. CDAI, clinical disease activity index; DMARD-IR, disease-modifying antirheumatic drug-inadequate responder. Incidence rates from step-down baseline through 48 weeks for step-down-emergent AEs including non-serious infections were numerically higher in patients continuing on baricitinib 4 mg compared with those who stepped down to baricitinib 2 mg (table 2). Incidence rates for serious AEs (including serious infections) and AEs that led to discontinuation through 48 weeks in the step-down study were similar between groups. Findings were generally similar for the subset of patients in CDAI remission (≤2.8) at the step-down baseline, although in this smaller analysis set, the rate of events leading to discontinuation was numerically higher in the continued 4 mg group (online supplementary table S10). RA-BEYOND is an ongoing LTE study designed to assess long-term safety and durability of baricitinib 4 mg or 2 mg administered once a day. The study included a randomised, double-blind evaluation of dose reduction from 4 mg to 2 mg in patients who achieved sustained disease control on the higher dose. In this substudy, dose reduction to 2 mg once a day was associated with statistically significant, if modest, increases in disease activity at subsequent assessments up to 48 weeks. However, most patients in both the continued 4 mg and step-down 2 mg groups retained the state of LDA or remission that led to their randomisation, and a large majority of patients who failed to maintain LDA or remission after stepping down to baricitinib 2 mg were able to recapture control with return to baricitinib 4 mg, if needed. Timely induction of sustained remission/LDA is a central element of the treat-to-target principles that underlie contemporary standards and professional recommendations in the management of RA.1 In recent years, guidelines have also recommended that DMARD taper (but not cessation) be considered in patients who have achieved sustained disease control.2 3 However, to date, few rigorous clinical studies have been conducted to inform such a treatment strategy. Randomised clinical investigation of dose taper following induction of control has been conducted for tumour necrosis factor inhibition; published findings were consistent with those of the present study.7 To our knowledge, the present study is the first randomised, blinded clinical trial to investigate this treatment strategy with a tsDMARD, and the first for any DMARD to form part of an initial registration programme. Associated data have been reflected in labelling in several regions where baricitinib is approved, including European countries, USA and Japan. The detailed 1-year substudy results reported here complement this information and are informative to clinicians who may wish to consider using a reduced maintenance dose of baricitinib after induction with 4 mg once a day. Guidelines may recommend consideration of DMARD taper for patients achieving sustained disease control, but in this large, randomised study, increases in disease activity were seen across populations, analyses and outcome measures when the dose was blindly tapered from 4 mg to 2 mg. This is consistent with observations from completed studies supporting 4 mg once a day as the more efficacious dose of baricitinib for patients with RA.11–14 The question therefore arises as to whether baricitinib dose taper following induction of sustained control is in fact an advisable approach in routine practice, where patients and physicians would be aware of the dose reduction, potentially further accentuating increases in perceived symptoms and signs of RA compared with the current blinded study. A number of observations can be considered supportive. First, 2 mg proved an acceptably efficacious dose for many patients, as evidenced by the fact that fewer than 1 in 5 dose-tapered patients were rescued back to 4 mg by their treating physicians. Of additional importance, for those who did need rescue, prior control of disease activity could be re-established with return to 4 mg. Finally, as a general principle, as long as acceptable efficacy is not sacrificed, use of lower doses may be desirable from a safety perspective, in particular for chronic treatments that are relatively novel. In this regard, although the data are limited, some safety trends appeared to favour the 2 mg dose, including overall AE and infection rates. Therefore, attempted dose taper after induction of sustained RA control appears a reasonable consideration with baricitinib. This study has a number of limitations. To preserve blinding, no radiographs were taken during the step-down substudy and, therefore, we cannot provide data on potential structural implications of dose reduction. Conclusions pertaining to DMARD-naïve and bDMARD-IR patient subgroups are limited by the small numbers of such patients presently included in the study. Patients with sustained control were randomised only after a minimum of 15 months’ treatment with baricitinib 4 mg. This was to provide sufficient stable exposure at this dose during the pivotal programme for intended regulatory registration purposes. It may not reflect the timing at which DMARD dose taper might generally be considered for individual patients in clinical practice,2 3 according to their individual circumstances, treatment goals and responses. It is also presently not possible to determine which characteristics, if any, might identify patients unsuited to dose reduction, for instance, those who might lose established disease control and then fail to recapture following return to 4 mg. However, it is reassuring to observe, based on present analyses, that if a subset of such patients exists it would appear to be small. Treatment guidelines currently advocate consideration of DMARD taper when sustained remission has been achieved, whereas for patients from studies other than the DMARD-naïve trial RA-BEGIN, LDA or remission was used as the inclusion criterion in this baricitinib dose-taper study. This design element aimed to recognise that a substantial proportion of participants were expected (and transpired) to have failed multiple prior DMARDs, and that for such patients, LDA may be a more feasible treatment target than remission. The fact that observations in the subset of patients in CDAI remission when randomised were generally consistent with the overall is reassuring as to the generalisability of the results. Use of CDAI (rather than SDAI or DAS28) as the principal disease activity instrument for inclusion may raise the question as to whether results could differ if patients were selected for dose step-down only if they achieved sustained LDA/remission using an instrument with an acute phase marker. The observation that LDA/remission rates at baseline were almost identical for SDAI and CDAI would seem to argue against this. No data were generated to investigate dose taper below 2 mg daily; although a reasonable question to consider, the results of earlier phase 2 dose-ranging studies did not further investigate such doses, as they would not offer patients an acceptable probability of efficacy in the current treatment environment.15–17 Finally, the present analyses are confined to the first 48-week period following randomised dose reduction. Expansion of these observations through evaluations beyond 48 weeks and in larger numbers of patients will be the subject of future analyses and intended disclosures from the ongoing study. In conclusion, these results from a large, ongoing phase 3 randomised dose-taper study indicate that in patients with RA for whom sustained clinical disease control has been induced with baricitinib 4 mg once a day, dose taper to baricitinib 2 mg results in increased disease activity for some patients. However, most patients can either retain clinical LDA/remission following dose taper, or regain it with return to 4 mg if needed. A slightly lower incidence rate of treatment-emergent AEs (including infections) was observed after step-down in the dose-tapered group compared with patients who continued baricitinib 4 mg. The authors thank SC of Eli Lilly and Company for creating the tables and figures and for assisting with manuscript preparation and process support.
. Discontinuation of biologics in patients with rheumatoid arthritis. Clin Exp Rheumatol 2013;31(Suppl 78):S22–7.
. The BeSt way of withdrawing biologic agents. Clin Exp Rheumatol 2013;31(4 Suppl 78):S14–18. Presented at This work has been presented at the 2017 American College of Rheumatology Annual Meeting, 3–8 November 2017, San Diego, California (Takeuchi T, Genovese MC, Haraoui B, Li Z, Xie L, Klar R, Pinto Correia A, Otawa S, Lopez-Romero P, de la Torre I, Rooney TP, Smolen JS. Dose reduction of baricitinib in patients with rheumatoid arthritis achieving sustained disease control: results of a prospective study [abstract]. Arthritis Rheumatol. 2017; 69 (suppl 10)). Contributors All authors have contributed to drafting and revising the manuscript and supplemental material documents to respond point-by-point to journal reviewers' comments. Funding This study was funded by Eli Lilly and Company and Incyte. Competing interests TT has received consulting support and/or speakers’ bureau fees from AbbVie GK, Asahi Kasei Medical KK, Astellas Pharma, AstraZeneca KK, Bristol-Myers KK, Celtrion, Chugai Pharma, Daiichi Sankyo, Eisai, Eli Lilly and Company, Janssen Pharma KK, Merck Serono, Mitsubishi Tanabe Pharma, Nipponkayaku, Novartis Pharma KK, Pfizer Japan, Takeda Pharma and UCB Japan. MCG has received grant/research support and/or consulting support from AbbVie, Astellas, Eli Lilly and Company, Galapagos, Gilead, Pfizer and Vertex. BH has received grant/research support, consulting fees and/or speakers’ bureau fees from AbbVie, Amgen, Bristol Myers Squibb, Celgene, Eli Lilly and Company, Janssen, Pfizer, Roche and UCB. ZL has nothing to disclose. LX, APC, SO, PRL, IdlT, TPR, and WM are employees of Eli Lilly and Company and may own stock or stock options in Eli Lilly and Company. RK is an employee of IQVIA. JSS has received grant/research support, consulting fees and/or speakers’ bureau fees from AbbVie, Amgen, AstraZeneca, Astro, Bristol Myers Squibb, Celgene, Celtrion, Chugai, Eli Lilly and Company, Gilead, Glaxo, ILTOO, Janssen, Medimmune, MSD, Novartis-Sandoz, Pfizer, Roche, Samsung, Sanofi and UCB. Ethics approval The study was approved by the institutional review board or ethics committee for each centre.